Hello, October! Is anyone as excited as I am to say that? I love Fall!! It is my FAVORITE season. We are FINALLY experiencing weather today that resembles Fall here in the midwest. It can be challenging to welcome Fall when the summer is so beautiful that you don’t want it to end and seems to linger on. As we have entered Fall, the days have become shorter and the weather has become cool and crisp. The colors draw us in to a new place. Various hues of refreshing and invigorating green are replaced with the excitement and warmth of red, yellow and orange. Carefree summer road trips have come to an end, school has started and routine has fallen back into place. The change of seasons make some of us want to wrap up under a blanket with a cup of pumpkin spice anything and watch it happen. Others want to throw on a blanket scarf and feel the crunch of the fallen leaves under their feet and be a part of the change. Regardless what you love (or don’t love) about Fall, you know the season is changing and you can take steps to embrace that change. My favorite way to embrace the Fall is to bring the change into my home. Our home is full of life. Full of family, laughter, music, singing and chatter. (Some barking from our four-legged friends, too, which I can’t say I love as much). To welcome Fall into the mix I like to add the colors and feelings of the season. Fall brings us to a place where we want to be surrounded by the warmth of the ones we love and to spend the crisp, cool nights within that warmth. It is the perfect time to fall into your own home and be thankful for the what you have and the people or pets that fill it and fill YOU. I am encouraged by the cozy elements of Fall to lean into the season. One easy way to do this is to add a cozy throw or two and have them ready for the nights in front of the fire. I’m talking chunky, crocheted or sweater knit throws placed over the arm of the sofa. You could also place them in a basket with a couple of extra pillows to cozy up with and settle in for movie night. I keep these in the family room so the kids can just grab ‘n’ cuddle. Don’t forget to change your decorative pillows to reflect the season, too. You don’t have to have pillows with pumpkins or leaves on them. Maybe go for pillows that have a heavier texture in your color palette. Below I have added heavier tweed pillows with fringed and jute edges and one that I found to be irresistible adorned with the word “nest”. Some people just don’t like the colors of Fall. You don’t have to invite orange in. There are options that will embrace the change of season. If your color combination is gray and yellow in your family room, for example, then opt to switch your lighter prints, patterns and colors for a heavily crocheted pillow in a warmer greige or sage-gray and a velvet pillow in a deep, rich golden tone to add the warmth of the season to the sofa or chair. Pillows are a great and inexpensive way to change a space. HomeGoods is my go-to. I love their pillows because most of them are down, interesting and relatively inexpensive. I don’t ever decorate with anything but down pillows. If it’s polyfill I will typically pass on it. Down pillows are also easy to store because of their ability to be “squished” down inside of a bin or placed in a trash bag on top of a shelf and not lose their shape. The wreath. To me, a wreath represents the family. A circle that never ends no matter what. Add a wreath to your door to welcome all who come to visit. To be reminded of the love within the family that resides within your walls and family that is separated by miles. You can find a wreath on my door regardless the season. I have made my wreaths in the past using an inexpensive grapevine wreath and elements from the outdoors. 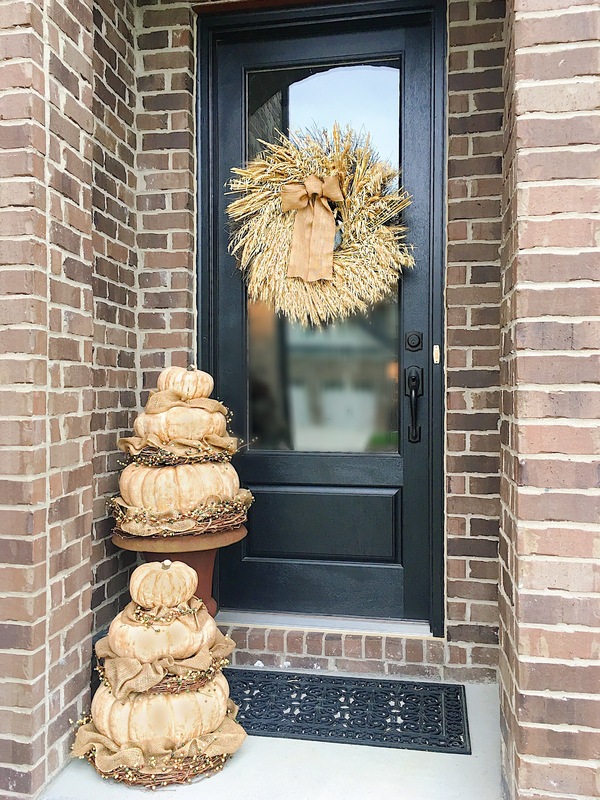 This year I opted for a larger wreath made of wheat with a simple burlap bow. I love the tone of the wheat and wanted a simple look paired with my pumpkins. I had some pumpkins that I aged, attached to grapevine wreaths and stacked. I then incorporated some simple garland of berries incorporated with burlap ribbon. Simple. Pumpkins are a sure sign of fall. A trip to the pumpkin patch is so fun and is usually accompanied by cider and carmel apples! The kids love the pumpkin patch. It is always fun hunting for the perfect pumpkin. Using those precious picks to decorate your home not only reminds you of the fun you had gathering them but also adds the welcoming hues of the season to a front porch or hearth. The kids also get a kick out of their contribution to Fall decorating. Pine Cones are generally regarded as a winter element and saved for Christmas decor. However, I like to use them in the fall. They are the perfect tone and texture to mix in with the colors of Fall. Right now I am really loving mixing in the brown with the muted tones of cream, sage and coral versus the traditional bright red, orange and yellow. You don’t have to stay within the confines of the traditional tones. Decorate your mantle with items inspired by the outdoors at this time of year. An old window can be picked up at a local antique shop or flea market and adorned with a simple wheat wreath. I picked this one up for $30.00. You can add in some sparkle by simply antiquing the glass to make it look like a mirror that has a natural patina. It can reflect the warmth of a candle flickering on cool evenings and be inviting over a roaring fire. Candles in various sizes give height and, paired with the original panes or patinated glass, will add some depth. Add a few pinecones, pumpkins and gourds for dimension and visual interest. I found these wheat bouquets and hops at a local shop. I love the way the hops drape down over the mantle. I am considering aging the window panes with an aged mirror look to 1. add some depth and reflective light and 2. to cover the t.v. cord inlet and outlet. Just writing this post has made me want to jump into the car and head for Hobby Lobby and HomeGoods RIGHT NOW!!! It may have inspired you to feel the same….but don’t forget your coupons! What are YOUR favorite ways to decorate for Fall? Comment below!